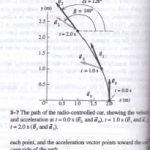 The techniques we have used in this chapter for calculating I are useful only if the charge distribution is known. In many the charge distribution is not known; instead, the value of boundaries of a region. For instance, in an electrostatic is always an equipotential surface, but the distribution a in general not uniform and is not readily calculated by the so far. Consider a region of space enclosed by one or more fixed potentials (for example, by a battery). How can we function of position in this region? The key to solving this problem is to use the following In a region where there is no charge, the value of equal to the average of the potential values at surrounding by using Gauss’s law in conjunction with Eq. (24-19) field components in terms of partial derivatives of the We’ll confine our discussion to situations in which the coordinates, x dy. An example is the potential due to a cussed in Example 24-10 (Section 24-4); the potential point’s coordinates in a plane perpendicular to the axis of z along the axis. For such a two-dimensional si coordinates (x, y, z), and enclose it by a Gaussian surface of side 2t..1 centered on P (Fig. 24-23). If there is no the box, the total electric flux cI>E through the box is equal component of the electric field E, JV/iJz equals zero a function of z. 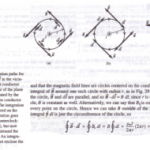 Hence there is no flux through the two faces are parallel to the xy-plane. Since the box is small, to a through each of the other four faces of the box is equal to of E at the center of each face and the area figure. The P is the average of the potential values at the points t becomes exact in the limit that t.l becomes to calculate the potential due to a set of charged . c situation. Figure 24-24a shows a hollow conducting and with a long axis parallel to the z-axis, The length of than the dimension L. The top of the box, labeled a, is collectively labeled b this is done by having the top be a small gap between it and the vertical sides of the difference Vo is maintained between segments a and b this of the lower segments to be Vb = 0, so the potential ‘•. As a result of the potential difference, there is a positive conductor) and a negative charge on b (the lower trial V at all points in the interior volume of the box. potential inside the box is to a good approximation a making a rectangular grid of points inside the box The outermost points of the grid are on the (24-35) then relates the potential at different grid potentials of the conductors are specified, we can point in the empty interior of the box Eq. 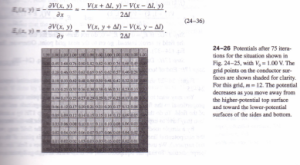 (24-35) relates the values of the potential at of V is unknown at each grid point in the interior of the by two or three other interior points at which V can’t be used to solve for the values of the potential Instead, we have to use an iterative method we will. make a series of successive approximations to find a set of points such that Eq. (24-35) is satisfied at every point. The do this is called the relaxation method. Here’s a skeleton of a computer program to carry out this steps. Step 1: Choose a positive value of the potential difference below runs into trouble if V.
Step 2: Choose the number m of grid points across or down 24-25. The total number of grid points is then m2, and the the interior of the box is (m – 2t Values of m between 10 of m require lengthy calculation) small values of m give 1. Step 3: Let U, k) be a pair of integer indexes that identify a location in the grid (the column and kth row in the grid. Step 4: Begin a loop on k, from k = 1to k = m.
Step 5: Begin a loop on from = 1 to 10 = m.
Step 7: End ofloops over j and k.
Step 8: Specify the desired accuracy of the results, The program is about to begin iterating to find a solution fur .U the box, and the iteration will stop when the fractional iteration to the next is less than the desired accuracy. the smaller the value chosen, the more iterations. Step 9: Define a quantity 0 (lowercase “delta”) and set it. Step 10: Again begin a loop on k, this time from k = 2 to = points only). Step 12: Compute new values of V,U,k) for area I (24-35). 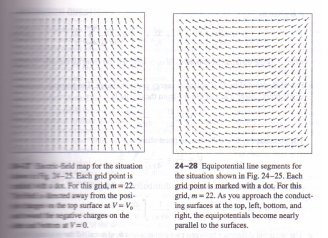 (The loops over j and k do not include !bevalues of the potential on the conductor surfaces V new U. Step 13 Referring to Fig. 24-25, this means that the new is the average of the old values of Vat the four right, the left, below, and above. Step 14: Calculate the fractional change in 5″7 :=11 II the new value, and take its absolute.error will result if V (j & k) = 0 this is the reason for our note at the end of. Step 15. If 6 VIV is greater than Ii, set Ii equal to lace the old value of V by the new value. Step 17, there or grid point at which the change in V during the iteration just than the desired accuracy. Hence one or more additional red and the program must return. Step 18. If the value of Ii is less desired accuracy, the current values of V U, k) are adequate, and the rl. Step 19. potential for each grid point the result of this calculation above is actually easier to implement with a spreadsheet than as BASIC or Pascal. Most popular spreadsheets will automatically go through the steps described above a square grid of spreadsheet cells, enter the values in the cells on the periphery of the grid, and enter the formula 24-35) into each interior cell. Step 20. The results shown in Fig. 24-26 spreadsheet. Y. the above program to treat other types of conducting boundaries on the conducting surfaces can be chosen at will. The box can to a rectangle by having a different number of rows than shapes other than rectangular. Various suggestions are have been calculated for all grid points, the electric E, can be calculated as well using equations similar to Eq. y) in the interior of the box, we can find E, and E, using the You can verify that the distance between these points is c and that line is the same as that of it at (x, y). To draw lines indicating the direction of it at each interior lowing additional steps between Steps 17 and 18 in the above This may be easier to implement by using BASIC or Pascal than Step 17: Choose the screen coordinates (addresses of which the grid points and direction lines of it will be drawn, These values are determined by the characteristic. example, a Macintosh with a 14-inch monitor or a PC with and Some languages let the screen coordinates. In BASIC, for example, the V. you choose any range of x and y you like; it does the converses for you. Step 17 : Choose the distance l (the spacing, in pixels, D l screen) so that all the grid points will fit on the screen. For rows and columns is m = 20, choose l to be I O of the Set the line length c equal to Step 17: Begin a loop on k from k = 2 to k = m – 1 (interior p Q : 115 Step 17: Begin a loop on from = 2 to j = m – 1 Step 17: Calculate the x- and y-coordinates of the ing to the current grid point You may want to refine the calculation to draw at each . proportional to the field magnitude E this shows both the of the field. To do this, simply replace the parameter c in S You may have to experiment to find the appropriate scale By a simple modification of the technique used to create the in the xy-plane (the cross section in we use the idea that when an perpendicular. 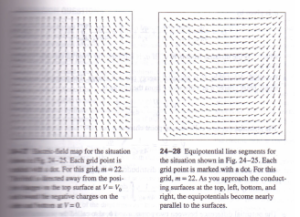 To map the equipotentials, we draw a line in figure.